Stratford Head Coach T.J. Cavaliere during football action against Masuk in Stratford, Conn. on Friday Sept. 9, 2016. The triple option at Barlow will be going nowhere. Another proponent of the unique attack will take over the Falcons’ program as T.J. Cavaliere was named the new coach. Cavaliere coached at Stratford from 2014-16 and will replace longtime legend Rob Tynan, who coached the Falcons for 27 years and built the program from the ground up. It’s a challenge some might avoid, but it’s one Cavaliere is relishing. Cavaliere is no stranger to the program, either. He worked with Tynan the past two years as an assistant, coaching the running backs and secondary. 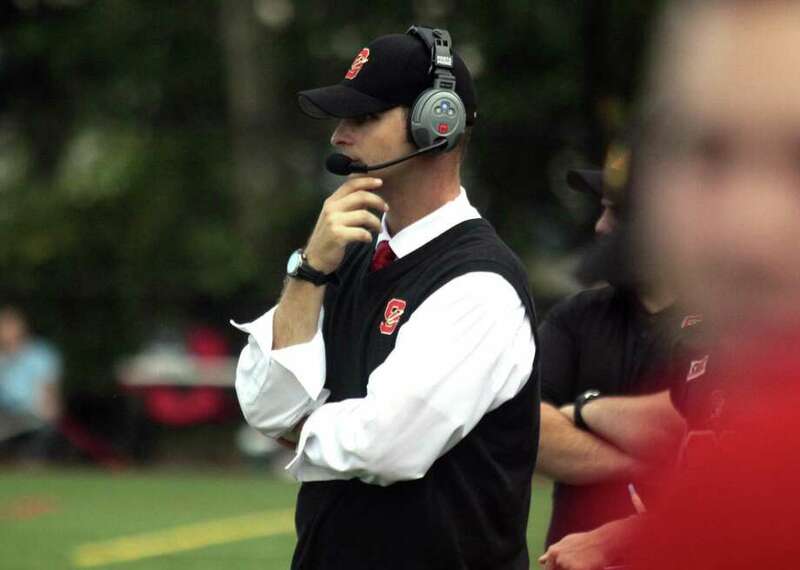 A proponent of the triple option, Cavaliere will ensure the transition is a smooth one. Cavaliere went 14-18 at Stratford in three seasons, including leading the Red Devils to the playoffs in 2015. Tynan led Barlow to the Class M final in 2017.